Charlotte Amalie is the capital of the United States Virgin Islands. It is also the most popular cruise port in the Caribbean. 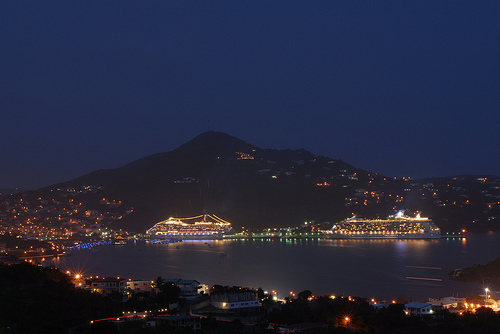 Charlotte Amalie (named for a Danish Queen) is where the ships dock. White and pastel houses are heavily sprinkled against a background of emerald hills. Colorful sloops dock along the waterfront. A few steps back, down alleyways lined with Old Danish warehouse buildings, is a world-famous shopping center. When walking in St Thomas, you see the bustle of Main Street, and cool emerald hills. Look for the view from Mountain Top. The spiral of winding streets from the base of Savan. The quiet French countryside feeling on the far side of the island. Hoteliers offer accommodations to suit all tastes. There are a wide range of accommodations on St Thomas that will fit every budget and every desire. There is the decadent luxury of the Ritz-Carleton and its endless pool. Here you can float in the sun and enjoy chocolate mudslides as you watch vessels coming and going to St John. A grittier option of camping on the beach at Cinnamon Bay is also an option. Between the two, you are sure to find the perfect place to stay. St Thomas has a variety of eating options. Sizzling seafood scampi, schnitzels galore, pasta’s tossed with island-grown herbs or Caribbean-caught fish, Danish-style smorgasbords, sushi bars, Cajun Crawfish Etouffe, Coconut Curry Lobster, Chateaubriand and even Peking Duck – you name it, you can get it in St Thomas. Dining options rival many major cities in food choices per square mile. The relatively small size of the islands means that one of its most awe-inspiring natural resources is within easy traveling distance. The beaches in the Virgin Islands routinely rate among the best in the Caribbean, and offer variety unheard of on many islands. Not everyone will have a full day of activity planned when stepping off a cruise ship. If so, a walking tour through downtown Charlotte Amalie is a nice option. From our newest on-island attraction, the Zip Line, to eco tours, aquarium, boat tours and botanical gardens there is more then enough attractions on St Thomas to keep you busy. Most often, you are going to have to use transportation to reach your destination. It is highly recommended to arrange transportation before you arrive. Coming by ship, talk with your travel agent or cruise director for transfers. Otherwise, ensure to use licensed Taxi’s. The US Virgin Islands is outside the US Custom Zone. A special exemption of $1,600 for each person traveling to this U.S. Territory is allowed. Family members traveling together may combine total purchases. Many items are individually exempt. Looking at St Thomas harbour in the early evening. Photo courtesy of F H Mira. A number of dive shops serve St Thomas and provide a safe, comfortable scuba diving experience for beginners or experienced divers. Coursed for both beginners and those seeking advanced certification courses are available here. To truly experience the beauty of the islands, many visitors elect to explore the hundred or so island islets and cays comprising the Virgin Islands by boat. Be it an afternoon to evening daysail or an all-inclusive week on a charter yacht. If your visit to St Thomas will involve more than just the downtown core then ground transportation is necessary. The most efficient way to get around the island is to get a Taxi. Here you will find typical Taxi Tariff’s (rates) to and from hotels and the airport. Some Taxi’s also operate like a transit system taking a number of different people or groups point-to-point. There are a number of professional wedding planners on St Thomas. They can help you get as wild as your imagination; from an underwater party on a submarine to a helicopter ride to isolated Hans Lollik for a ceremony and champagne toast. It is your special day, leave the work to them and just enjoy!